Minister Murphy was asked to make a statement following a row last week over hundreds of adults and children being removed from the March homeless figures. THE DÁIL HAS heard another robust exchange between the Housing Minister and opposition spokespeople over which groups of people should or should not be counted in monthly homeless figures. 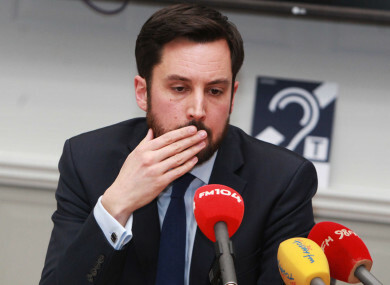 Housing Minister Eoghan Murphy was taking Priority Questions today in the Dáil. He was asked to make a statement following a row last week over hundreds of adults and children being removed from the March homeless figures. Murphy said that the issue – which he has said involved local authorities “miscategorising” at least 600 people as homeless – was being examined and that he wasn’t in a position to provide a full account of the matter. He did say that a total of 247 adults and 331 children – who he said were residing in houses and apartments - had been categorised as living in emergency accommodation and had been removed from the March figures. “I’m satisfied that individuals who and families who are being accommodated in publicly funded houses or apartments – whether it be social housing or homes leased from the private rental sector – should not be considered as living in emergency accommodation,” the minister said. Sinn Féin housing spokesperson took issue with the minister’s statements. Last week, Louth County Council’s housing services sent a memo out to councillors saying that it was told by the Housing Department not to include people the council considers homeless in the monthly homelessness figures. Speaking today, Ó Broin said that 80 of the 100 families removed from the March figures were living in emergency accommodation and should not have been removed from the monthly numbers. The debate continued in this manner, with both parties using different definitions of homelessness. The minister insisted that people were being included in homeless figures who were “in homes” and that they should not have been. “People were in homes. With their own front doors, their own keys. Some for as long as two years,” he said. And they were being counted as being in the same situation as someone who is in a hostel, who has to go out and walk the streets every day. That’s not the case. He said these groups may not be in “their forever home”, but that it was wrong to equate them with people living in traditional emergency accommodation. “They will be going into a home from a home – they are not in emergency accommodation,” he said. Analysis: If a family are living in accommodation paid for through homeless funding, does that make them homeless? Ó Broin hit back, stating that the minister was “changing the definition” of emergency accommodation. “So the idea that because somebody is left languishing in emergency accommodation for two years you’re now going to say that they’re no longer in emergency accommodation is truly astounding,” he said. You are reclassifying in a fundamental way the definition of emergency accommodation and I’ll say this: it is deeply dishonest, it is deeply insulting to these families. Both men also referenced Tallaght Cross – a collection of 65 units owned by South Dublin County Council and used as emergency accommodation for homeless families. The people living at Tallaght Cross have not been removed from the figures, but Murphy said today that people living their were not in the same situation as those in far more precarious and vulnerable situations. “Those tenants aren’t at risk of being de-tenanted. So you’re taking in this word now and saying temporary and precarious,” he said, in relation to the families at Tallaght Cross. So they’ve actually been in those tenancies for a very long period. They’re at no risk of entering emergency accommodation. He said that no decision has been made yet on whether those living in Tallaght Cross should be removed from the figures. “It is not fair on people who are in emergency accommodation – and who are experiencing that crisis in their lives – to be said to be in the same situation as someone who might be in the private rental sector, have never gone into emergency accommodation, and is not at risk of being in emergency accommodation,” the minister said. Fianna Fáil TD Pat Casey also quizzed the minister over the classification. “While you might say that these are in houses for two years they are not in secure tenancies. And in fairness they should still be considered homeless,” Casey said. Murphy said that the body of work would be published on the matter once it was completed. He also referenced reports from this weekend that the government was considering removing homeless non-nationals who may not be entitled to live in the country from the monthly figures also. “No one’s talking about recategorising non-EU nationals but we have to face up to the fact that if they don’t have tenancy rights they’re going to be trapped permanently in emergency accommodation. So what’s the proper way to support those people?,” he said. “Why are you so desperate for the figures to go up?” he asked the opposition TDs in his final remarks on the matter. Email “'They are not in secure tenancies': Debate in the Dáil over who should be categorised as homeless”. Feedback on “'They are not in secure tenancies': Debate in the Dáil over who should be categorised as homeless”.